I love to hear how you enjoyed the books. Please leave a comment using the form at the end. TM @Victoria I just got your book in the post! OMG it is sooo good! I took it to the beach and I’m already 1/2 way thru 🙂 Just LOVE it ! This book: Chickens, Mules and Two Old Fools by Victoria Twead is actually making me laugh out loud, it’s pure genius! @Victoria The story is engaging and beautifully drawn in a very down-to-earth, refreshing style. This is exactly the kind of tale that captivates me and feeds my interest both in travel and cross cultural issues. I read it in one greedy gulp over two days and hated to see it end. The good news is that there are sequels! @VictoriaTwead Indeed – a very nice read – so when’s the film? – so many funny and interesting people and situations – you should phone Channel Four! Finished @VictoriaTwead ‘s ‘Chickens, Mules and Two Old Fools’, today. What a delight. Plan to keep it to read whenever I need a sunny day! @Victoria I am going to get a “real” copy of your book as a gift for a friend who could use the laugh! Loved it. It was the funniest travel/cook book that I have ever read. I know for sure that I have to go to Andalusian one day. Awesome place with awesome people!! I just had to read this book after reading that great review. It was light and fun and I loved all of the characters.The perfect read to escape the rainy weekend. I love the idea of house swapping! Chickens, Mules and Two Old Fools by Victoria Twead is a great book, make yourself comfortable because you won’t be going anywhere for a while. Twead delights her audience from beginning to end, taking them with her through the persuading of her husband to move to Spain to the end of their agreed five year trial. 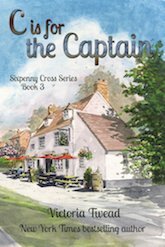 Wit and natural humour keep the reader turning the pages in complete enjoyment as Twead’s enthusiasm leaps out of her words. Be absorbed in their neighbours and their chickens’ antics, tremble in fear when their cockerel is on the rampage and be wholly delighted as you make their tale your own. This is the most enjoyable book I’ve read for a long time. This book was so good I really regret the month I spent not being able to read it from when my copy arrived. See my video post about it below but really just go to the Amazon link and buy it. The highlights for me are the anecdotes about the jellyfish sting, the snake and the whole saga of the chickens. This is one of the few books I have read recently that has actually made me chuckle out loud and the recipe interludes are inspired. Pull up a comfy chair or snuggle down in bed with this book and you’ll be rooted for hours. From page one it puts a smile on your face. Victoria Twead weaves a great yarn, her writing warm and friendly and her story-telling ability just great. I found it hard to turn out the light and I live in a remote village in Andalucia. Her book just rolls along with their adventure, persuaded hubby and herself, from deciding to give a new life a five year trial to the decision at the end of that time. Stubborn mules, wacky neighbours, crazy chickens and local recipes all help the “two old fools” through the tough parts and hard work of renovating a home while living in it. There’s not many a moan or groan in these pages just sheer glee at every turn, her enjoyment oozes out of the pages and invites you to experience every moment from chicken watching to culture shocking moments, stencilling the chicken pen to the house-swap finale it’s fabulous fun. Your book is the best book I’ve read in a long time – I just couldn’t put it down, meeting all the characters and living your life with you was fab. @VictoriaTwead Your writing reminded me a lot of Gerald Durrell – I read My family & other animals for 0-level & loved it. HP, Hungary Hi, i am half way through the book although hubby had read it all ready. sorry but i have great difficulties reading for more than 15 mins but the book is so good you can put it down and not lose the thread of the story. I have also laughed my self silly and can relate to many things in the book, i presume most expats can as its so typical of the many things that we all seem to go through. @VictoriaTwead I read chapter about Cocky at lunchtime. Still giggling now and I’ve been back at my desk for two hours! @victoriatwead Thanks for keeping my wife calm while she read your book. Thank you!! Hi Victoria, I just wanted to say from one exforces wife to another I loved your book. I have told every one to read it. I just couldn’t wait to get to the end to see how your 5 year plan went, even though my husband had already told me most of the book as he read it. I hope you accept me as one of your facebook friends. When is the next book out?? Forget the Christmas wrappings. Forget the roast turkey. Just pick up this book, nestle into your favourite winter sunny corner and let the world float by with this very relaxing read. Why? Because when you start turning these pages you will forget your surroundings until the closing pages.This novel is justified in being awarded the Harper Collins “Gold Star”. Mind you, you will be laughing out aloud, but make sure your “better half” waits his / her turn until the end. Don’t spoil the moment! A book for Expats, parents, grandparents, teenagers and those poor souls wishing they were living out here. Vicky and Joe Twead relocate from Southern England to an idyllic Andalucian life, tucked high up in the Alpujarra mountain ranges. If you are suffering wintry cabin fever blues anywhere in the world this book will definitely raise your spirits as you savour and share all their hearty frolics. Besides, you will surely be tempted to test and taste Victoria’s provincial Andalucian dishes. Well, they will make a change from turkey leftovers, I dare say! You will chuckle along amongst the gaggling chickens called B*gger and F*ck (I kid you not!) and the upturned water fountain – a precious commodity in dry Southern Spain, and the gurgles of the gin twinlings. Weeks later, after finishing the book, you will be standing at your kitchen window doing the dishes and then recall some fleeting scene with chickens or mules or two old fools of characters and laugh out loud all over again. Hi Victoria, I just wanted to add my congratulations to you on your hilariously funny book. I started it last night and have about a third left to read. I have had to put it down just so I can get some work done! We too have a little house in Almeria and I am enjoying reading your stories, so true to life in this area!! Hi Victoria – I would just like to add to the growing list of positive comments about your book. You have done what I originally intended, however, I have ended up in a big urbanisation on the coast – for the moment! I’ll be looking for my little place in the campo some time in the future so your book has been a wonderful guide to what I can expect. The book was such a good read, I have passed it over to my neighbour who keeps laughing out loud as she reads it on her terrace! I also told the bookshop at Dos Mares that they need to stock it, so hopefully you should see sales climbing and climbing. Can’t wait for the sequel! @victoriatwead loving your book Rex told me all about it so I knew what to expect but still loving your writing. 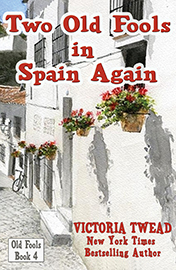 Peteranne, Eye on Spain forum: Hi Victoria and Joe, I want to say how much I enjoyed reading your book, I had put it on my Christmas present wish list. I would recommend the book to any one, it was fun and easy to read, very amusing, had me laughing out loud many times. We envy you living your life in Spain, and how you have integrated with the Spanish very well, and they have obviously taken to you too, because you make an effort to talk to the people of the village and join in with their activities. I am glad to hear there is a sequel, can’t wait for that to come out. Do keep us informed when we can buy it. We had our children in the same year as you, my daughter is 30 this year – tomorrow in fact, – it really does make me feel old and like you I am only 35 in my head! hi , I finished ur book and loved it, it was great. now I know what I want to do in my retirement. Sad because I’ve just finished reading @VictoriaTwead’s book. Do you think she’ll write another if we ask nicely? @VictoriaTwead ‘Chickens’ still v much with me,such vivid mental images of Judith & her glam mum, who btw is an example to us all! Hi Victoria, Looking at the entries there’s a lot of interest in “Chickens”. I know it will disappear off the shelves. Are you thinking of a follow up book yet? lol. Take it easy and get over the shock of “Chickens” selling out of its first run. What a fabulous book! I was given it for Christmas but only read it this week and I just couldn’t put it down. I thought it was great because it all seemed so tempting to go back to simplicity and I loved the chickens and their antics. Thanks for the laughs! Mendygnl, BackYardChickens: Victoria, I ordered your book and it just arrived yesterday. I’m enjoying it so much and enjoying the tales about the village inhabitants. Thank you. Love the stories from you, Victoria!!!!!!! A thoroughly enjoyable and entertaining book which had me in fits of laughter. This is a tale of a couple who moved to a tiny Spanish village in the Alpujarra mountains, the challenges they faced and the way the locals welcomed them into the local community. Victoria’s description of the chickens and their various escapades made for hilarious reading. I will never look at chickens in the same light again….what wonderful characters! If you only read one book this year…make it this one! HB, Bulgaria: Hi Victoria, I asked for (and received from my father) your book for Christmas having been on your mailing list for some months, and read it in the space of a couple of days – only putting it down when the need arose to carry out the other essential tasks of daily life! A delightful read and well worth the wait – thank you! At times when reading your book I felt like you must be my Spanish twin. And maybe you will be pleased to know that our first chickens are due to arrive next weekend (I’ve never kept chooks before) so this week I will be attempting to build a lean-to to house them at night. They can have free rein round the property in the daytimes until we start planting our first crops, when they will have to be fenced off part of the garden! Looking forward to becoming part of a chicken gang, anyway! Thanks again for your inspiration! Hello, bonjour, ça va? que tal? and I just want to say how much I enjoyed your book. It did make me laugh in places where it sounded so familiar to all our experiences here in France. It’s the best book I’ve read in a long time. Can’t recommend it enough. BR @VictoriaTwead Just finished CM&TOF. Brilliant!. You are living my dream. If it was made into a film, who would you want to play VT and Joe? Mn73 wrote: Non-fiction with a fictional feel. I started reading and then just kept going. Love all the stuff at the beginning as you tried to convince your husband. I love the sense of humour throughout and absolutely delighted in following you and your husband on your Andalucian journey. 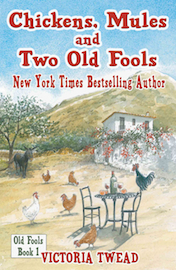 Denise Morland, USA Chickens, Mules and Two Old Fools proves once again that moving to a foreign country and fixing up an old house never works out quite as you planned. This time the setting is the Spanish Alpujarra mountains and the naive couple are Joe and Vicky, a British couple looking for a place where the sun always shines. Vicky comes across with a refreshing frankness, leaving nothing out as she and Joe stumble their way into their idyllic, Spanish life. You haven’t properly described the book until you explain how utterly hilarious it is. From the first meeting with their German estate agent where they have to explain that they would like a house with a roof and walls to their hysterical chickens and wacky building contractor with his team of Equators you will be laughing all the way through. I highly recommend this book for a lovely period of escapism. You will thoroughly enjoy hanging out in Spain with Joe and Vicky! Kirsten B wrote: Oh yes – It’s like Driving Over Lemons but better, with even more twists of humour and laughter. Tricia wrote: Love this!! I work at B&N and will track this down and buy it. Just the kind of thing I like. Alison Meacham, California wrote: I really enjoyed the book – it was truly one of those didn’t want it to end books. I could identify with your story to some extent as I moved from the UK almost a decade ago, but of course to a very different country. We moved to the US in 2001. It was interesting to see how welcome the locals made you feel. RJ on Twitter: @VictoriaTwead Am on train now, got 8 hours to kill. Book in hand, am at 9 & half dogs..LOL! Maureen, UK wrote: Congratulations Victoria, I am only half way through this book which only arrived this morning and I can’t put it down, dreading coming to the end of it. I can just picture you up in that village. Take care and thank you so much for such a good read and a good laugh. Just finished your book, I put it down as I was getting near the end and wouldn’t touch it for a few days as I couldn’t bear to finish it, I am missing it already, what a fabulous book, your life in Spain sounds brilliant. Please let me know how your all getting on, you Joe and the chickens, hope they are producing their eggs again, bought some massive ones at the weekend and they are all double yokes, they reminded me of you. NE On Twitter: @VictoriaTwead Book arrived, thanks. Mum’s nabbed it but I’m next in queue. Mum loving it & keeps roaring with laughter. @VictoriaTwead Just finished ‘Chickens & Mules’. Really loved it. Great characters and couldn’t put it down. Whether saved by a mule or sitting at a party table in the middle of the road celebrating a neighbour’s birthday (and blocking traffic), ‘Chickens’ not only paints a warm, funny and colourful picture of rural Spain, but also tells of how two zany Brits came to fit right in. Light-hearted and full of sunshine. A thoroughly enjoyable read. Giving your book for Christmas was a big hit with my English g.f. !! Cas P, UK wrote: Hi Vicky, This is an absolute delight. I’m sure most of us have toyed with the idea of relocating somewhere warm (with us it’s Italy, as we spent 3 years there once) and it’s fascinating to read the tale of someone who’s actually done it. I really felt the depression of the constant English rain. I also loved the description of the house-search and the way they fell for The House. I’m sure it’s not just because of all those ‘living abroad’ programmes that I could see and smell and taste it all. The image of ‘Mule’ bouncing round the streets looking for her master was so endearing. I fell completely in love with Cocky. I can quite see why he had to go, though! I can very much see why ‘Chickens’ has a shiny, gold star. This is just lovely. I was entranced and thoroughly enjoyed coming along for the ride. What I love best are the details; they helped to make Spain come alive for me and the myriad quirks of each person had me laughing and reading on. Sylvia, UK wrote: What gorgeous and humorous writing, Vicky. I laughed aloud. This is extremely funny and very well written. I think you’ve perfectly captured the spirit that moves two people to begin an entirely new life in a foreign country. The cast of characters they meet is peculiarly charming, and the things that happen to Vicky and Joe are believably comical. Before I forget, Joe has the patience of a saint – I would have gone crazy over going back for that painting. That made me laugh a lot. And poor man – the trotter. You make the narrating voice engaging and have mastered the task of conveying the other characters and their eccentricities so that we are hooked in. It has a My Family and Other Animals feel about it in that sense. I even felt an urge to bite the pig’s trotter for the experience. As someone who’s had to move house too often and hates it, I was rolling my eyes in sympathy over Man with a Van. There really is something here for everyone – those who like travel, those with the dream of moving abroad, those who love an eccentric cast of secondary characters, The tone is perfect for a light enjoyable read – summer afternoon in the garden or alternatively a winter evening inside for escapism. I love this. You’ve made me feel as if I was there with you. The characters are wonderful. I know they are real but you’ve made them come alive on the page. The reader can see Judith and her dogs, Kurt with his sales pitch and Joe with his practicality. The prose flows so smoothly and is easy to read. It’s got humour and irony. I have to say that I immediately fell in love with this story. The bit about the lists, followed by the list itself! Joe’s return list… made me chuckle. I like how ‘The House’ is capitalized. That sort of thing isn’t done here in America, it’s so British and cool. The first two houses were a riot, no roof and no walls… but a roof and a palm tree! Kurt is a riot. The line about trading sapphire skies for steel was really nice. Loved how ‘all’ the wheelbarrows in Spain are green with yellow handles. Isn’t it odd how some things like that just stand out? The line ‘Small boys with crickets not welcome’ made me laugh loudly. Cordelia wrote:I think you have a natural talent for writing and the book flows effortlessly. I just kept on reading and reading ignoring the phone, doorbell, people talking to me!! I used to love watching the British show where people would go to Europe and buy, renovate or build houses to move to. Some bought houses to set up as B&Bs. Great stuff. So this book has two things I enjoy. A well written story and a great location. What a beautiful story, Chicky Vicky! Charming, romantic, I want to live in Spain. A friend of mine lived in Spain with her grandparents until she was 6 and sent to London to live with her parents. She still misses her first life as one of those free-spirited village children. How lucky you are to experience it. Very well written, lively, engaging. Judith & mother & the dogs, Paco & Bethina/Carmen, and the sister and brother in law were great characters. How could they possibly be real? People don’t make up characters as good as this in their fiction! Have you shown your sister this? Wow, a very fun and enjoyable read. I love how the narrative is pure story driven – no excess fluff – my kind of read. Great job. The idea for ‘Chickens’ is elegantly simple, and it’s a very easy story to settle into. I don’t know if this will make any sense, but I felt very cozy and at home while reading it. It is that cheerful zaniness that produces the laughs. Skilfully done. Chickens, Mules, and Two Old Fools has a good soul, loving Andalusia and its inhabitants warts, vagaries, and all. You genuinely feel for Vicky as she and Joe embark on their quixotic adventure in the south of Spain, but still can’t wait to see what embarrassing and potentially perilous situation will draw them in next. Beautifully and comically painted portrait of living the ‘easy’ life as an English expatriate. Love your books, want to try all the recipes. Put a notice to my Facebook friends to read all the books! Last night I finished the last of the “Chickens” series and felt like I was leaving friends I’d never see again. This morning I checked out this site and I’m thrilled to be able to follow your wonderful lives until the ‘next edition’ comes out??!! I absolutely loved this series and felt as though I lived there with you both in El Hoyo. Thank you for writing and sharing these marvelous stories. I look forward to more. All the best to you and Joe. Just finished reading the last book of chicken series. I loved them all. You made me want to live in El Hoyo. Can’t wait for your next book, please hurry…..
Victoria, I love read your books mainly because of the people you bring to life on the page. Each one touches me in so many ways. Your “Chicken” books were hysterical, I could picture all of your adventures with a new country and circumstances. Looking forward to more stories! Dear Victoria, I’ve just finished reading Chickens, Mules and two old fools and thoroughly enjoyed it. I too live in a small village not far from Granada so I can relate entirely to some of the tales you relate, particularly in relation to the locals. Not that I want rural Spain to be filing up with expats but I would persuade anyone thinking of moving here to consider the country life (where life is real) instead of the pretence of emigrating to the costas. Keep on writing! I’m now on the fifth book, and I do dread coming to the end. I’m 73 and regret that my husband and I have never had your sense of adventure. I know a few of your fans have already addressed this topic, but being an English teacher, I’m surprised that you would make the same grammatical error over and over. Perhaps grammar in the UK has different rules. On page 35 (on IPad) you write, “It allowed Karly and I to chat frequently.” This is book 5. You would not say, “It allowed I to chat frequently.” To be correct shouldn’t it read, “It allowed Karly and me to chat frequently.”? Thus removing the other person would be the correct use. ” It allowed ME to chat frequently.” Your proof reader should have caught this. I’m looking forward to the 2019 release of your next book.